Landing hard-fighting fish on fly tackle requires exacting performance. 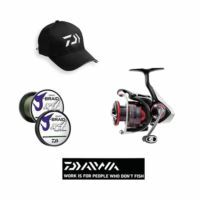 That's what Daiwa's Lochmor-A Fly Reels deliver. No wobble or play-just a smooth, precision feel. The feel of quality. Precisely what you need to best spirited species on the long rod. 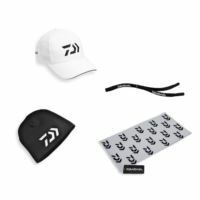 At a surprisingly affordable price. 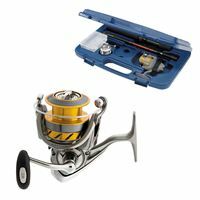 LM200A fly reel: single action, 1-piece aluminum frame, large arbor, drilled spool and frame, click drag. 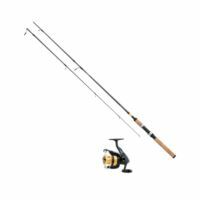 AGQ9064 rod is a 9 ft., 4-piece, (recommended #6 line weight), with thin diameter, natural cork, aluminum reel seat. 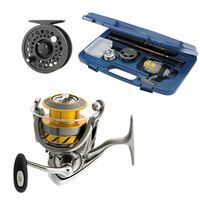 Reel - "CROSSFIRE" 2500: 5.3:1 gear ratio, 2 ball+1 roller bearings.Rod - "Sweepfire" SWD662MFS: 6-1/2 ft 2-pc fiberglass rod.Line - Quality monofilament line. 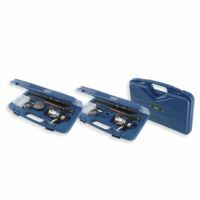 Tackle Box - "Tactical" soft-sided medium tackle box.Storage Trays - 5 x 3600-sized trays.Pliers - A pair of "Deckhand" style 6-in needle nose and cutter in sheath.Rod Wraps - A pair of neoprene rod wraps to secure rods.Cap - Daiwa "D-Vec" Black CapFree Bumper Sticker "WORK IS FOR PEOPLE WHO DON'T FISH"
Reel - Model "Exceler" EXLT2500D-XH. 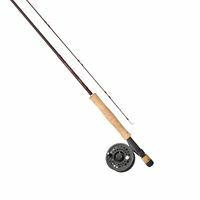 Carbon Light body, 6.2:1 gear ratio, 5 ball+1 roller bearings.Rod - "Wilderness" WN666SFBP: 6-pc fiber glass spin/fly rod.Line - Quality monofilament line.Case - "Executive" hard travel case + a clear tackle case. Reel - "Fuego" FGLT2500D-XH 6.2:1 gear ratio, 6 ball & 1 roller bearing, carbonlight body.Rod - "Ardito" ARDT703MFS-TR. 7ft 3-pc. 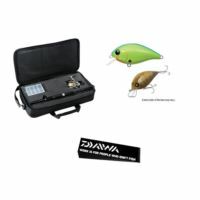 Daiwa's exclusive HDF graphitein semi-hard travel case.Line - "J-Braid" JB4U20-150DG, 20 lb 150yd in dark greenCap - Daiwa "D-Vec" Black CapFree Bumper Sticker "WORK IS FOR PEOPLE WHO DON'T FISH"
Reel - "Fuego" FGLT2500D-XH 6.2:1 gear ratio, 6 ball+1 roller bearings, Carbon Light body.Line - "J-Braid" JB4U30-150DG: 30lb 150 yd dark green, made in Japan.Cap - Daiwa "D-Vec" Black CapFree Bumper Sticker "WORK IS FOR PEOPLE WHO DON'T FISH"
Reel - LEXA-WN400HS-P baitcasting: 7.1:1 gear ratio, 6 extra corrosion resistant CRBB ball bearings + 1 roller bearing. Rod - "Saltiga" SAG703MHR-TR: 7ft 3-pc. 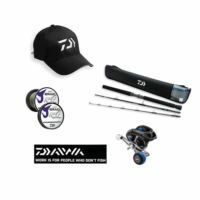 travel rod in semi-hard case.Line - "J-Braid" JB4U50-300IB, 50 lb 300yd in island blue.Cap - Daiwa "D-Vec" White CapFree Bumper Sticker "WORK IS FOR PEOPLE WHO DON'T FISH"
Reel - "Revros" REV2000-4BI. 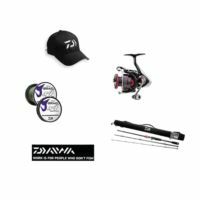 5.6:1 gear ratio, 4 ball+1 roller bearings.Rod - "Revros" REV665UL: 6ft-6in 5-pc graphite travel rod.Lures - 2 x "Evergreen" brand premium crankbaits.Case - Soft side case to house all of the above + a small tackle case.Free Bumper Sticker "WORK IS FOR PEOPLE WHO DON'T FISH"
Daiwa's new Revros spinning reel is a great value priced reel. Boasting features like Air Rotor, Digigear and ABS aluminum spool you simply can't find a better deal. 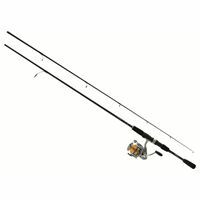 REV2500-4Bi spinning reel: 5.6 to 1 gear ratio, super smooth rotation, long cast aluminum spool, 5 bearings, balanced rotor, infinite anti-reverse, Twist Buster System, Digigear™ REV662ML is a 6'1/2 ft., 2-piece graphite composit rod with aluminum oxide guides. Comes with Megaforce Distance® line included. REV2500SH spinning reel: high-speed 5.6 to 1 gear ratio, lightweight body, Strong and light Airbail™, ABS long cast aluminum spool, 10 bearings, balanced rotor, infinite anti-reverse, micro click front drag adjustment, machine cut handle, Twist Buster™ System, Digigear II™ precision gearing and comes with free alternate size spare aluminum spool. Wilderness Series rod is a 6 piece, 6-1/2 ft., Graphite Rod. 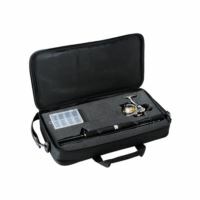 Comes in Executive Hard Case with Megaforce Distance® line included and clear tackle box. REV2500SH spinning reel: high-speed 5.6 to 1 gear ratio, lightweight body, Strong and light Airbail™, ABS long cast aluminum spool, 10 bearings, balanced rotor, infinite anti-reverse, micro click front drag adjustment, machine cut handle, Twist Buster™ System, Digigear II™ precision gearing and comes with free alternate size spare aluminum spool. Wilderness Series rod is a 6 piece, 6-1/2 ft., Graphite Rod. 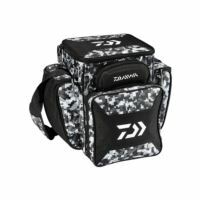 Comes in Executive Hard Case with Megaforce Distance® line included and clear tackle box with an extra Fly reel. Price and quality make Sweepfire the best value on the market today! 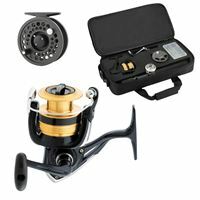 SWF2500-2B spinning reel 5.3 to 1 gear ratio, long cast aluminum spool, 2 ball bearing drive, balanced rotor, Twist Buster System, Digigear™ precision gearing. 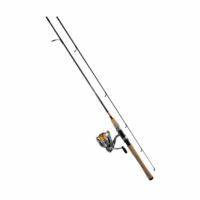 Wilderness Series rod is a 6 piece, 6-1/2 ft., Graphite Rod, comes complete with clear tackle box and in an Exectuive Soft Case style case and Megaforce Distance® line included with an extra Fly reel. 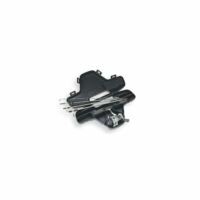 Reel - "Sweepfire" SWF2500-2B: 5.3:1 gear ratio, 2 ball bearings.Rod - "Sweepfire" SWD662MFS: 6-1/2 ft 2-pc fiberglass rod.Line - Quality monofilament line.